Hanging Kitchen Towels, at The Weed Patch! 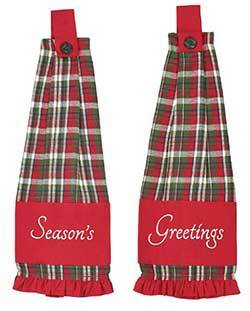 Best-selling style of dishtowel, with a buttoned-top hanging loop for attaching to a stove or refrigerator handle. 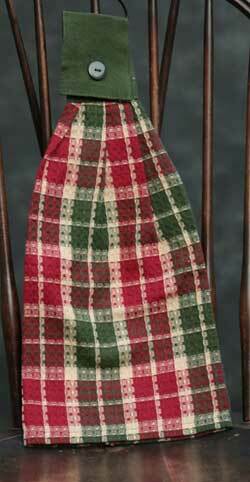 Features a plaid of black and red with touches of tan and green. Made of absorbent waffle weave cotton, with hanging loop. 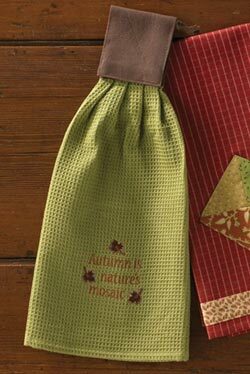 Hawthorne Hanging Dishtowel, by India Home Fashions. The Hawthorne Collection features a warm and woodsy palette of browns and cream in a striped pattern. 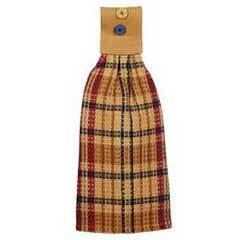 This is for the waffle weave Hanging Dishtowel, which has a buttoned loop for hanging. Measures approx 16 x 18 inches. 100% cotton. Kingston Hanging Dishtowel, by India Home Fashions. The Kingston Collection features a palette of cranberry red, black, green, and gold in a striped pattern. 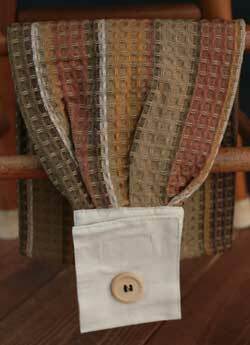 This is for the waffle weave Hanging Dishtowel, which has a buttoned loop for hanging. Tabbed top has a star accent. Measures approx 16 x 18 inches. 100% cotton. Navy Star Button Loop Towel, by Nancy's Nook. The Navy Star Collection features a classic primitive checked pattern of Navy Blue and TAN, with appliqued star(s) in solid navy blue. This is for the Button Loop Towel. 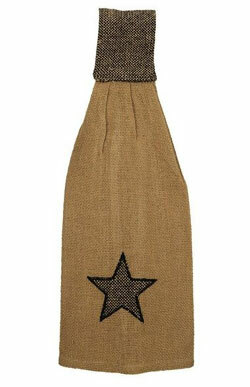 Has three appliqued stars on the front, and a buttoned loop for hanging. Measures approx 18 x 18 inches, plus hanging loop. 100% cotton. Matching table linens, window treatments, and more also available! Rooster Tab Towel, by Raghu. 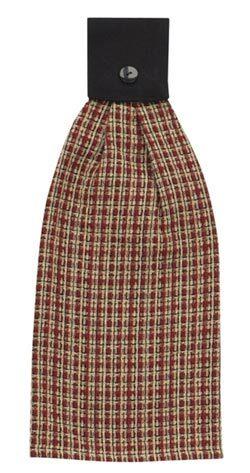 This oat-colored kitchen towel features an embroidered rooster and a burgundy check buttoned hanging loop. Measures 16.5 x 18.5 inches. 100% cotton. Machine washable (see label for care instructions). 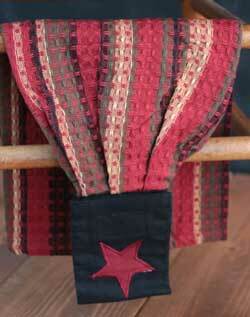 Features "Farmhouse" stenciling and grain sack stripes, trimmed with multicolored ticking stripe ruffle at the bottom. he Sawyer Mill Charcoal Windmill Button Loop Kitchen Towel brings a unique farmhouse look to your kitchen. Spring Breeze Hanging Dishtowel, by India Home Fashions. The Spring Breeze Collection features a pretty palette of cream, golden yellow, leafy green, and red in a large plaid pattern. 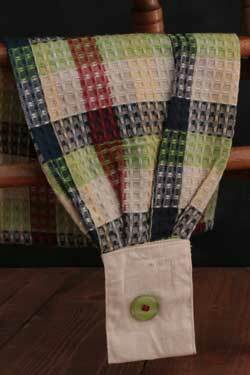 This is for the waffle weave Hanging Dishtowel, which has a loop attached for hanging. Tab top is accented with a flower. Measures approx 16 x 18 inches. 100% cotton. 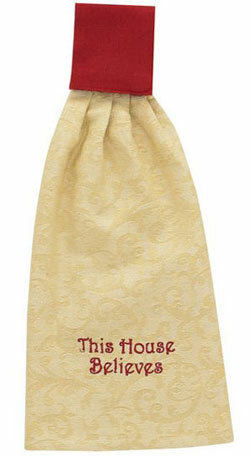 This House Believes Hand Towel, by Park Designs. Has a buttoned hanging loop for attaching to your fridge door or stove handle. Features embroidery that says This House Believes. 100% cotton. Machine washable. Other hand towels also available! 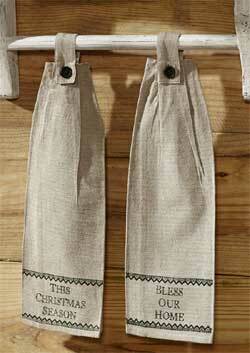 Timberland Christmas Hanging Kitchen Towels, by Nancy's Nook for VHC Brands. The body of these towels is 100% cotton creme chambray, with the saying "Bless our Home" and "This Christmas Season" stenciled in green. Each saying is surrounded by green lace stencil. 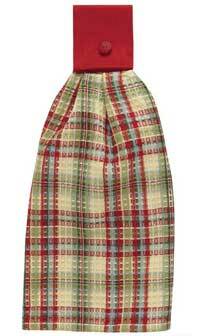 Veranda Hanging Dishtowel, by India Home Fashions. The Veranda Collection features a pretty palette of cream, golden yellow, sage green, navy blue, and red in a large plaid pattern. 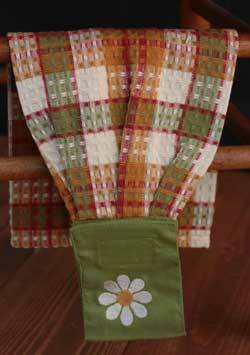 Whimsical Christmas Button Loop Kitchen Towels, by Nancy's Nook. The Whimsical Christmas button loop kitchen towel measures 18 x 18 inches with a working button loop that is 3.25 inches. 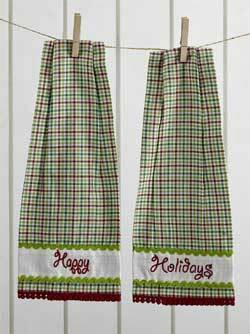 The body of the towel is 100% cotton red, white, and green plaid with a 100% white burlap patch with "Happy" and "Holidays" embroidered on the patch and green rick-rack on the top and bottom. The bottom of the towel is trimmed in red rick-rack. You receive the set of two shown. Other items in the Whimsical Christmas Collection also available!